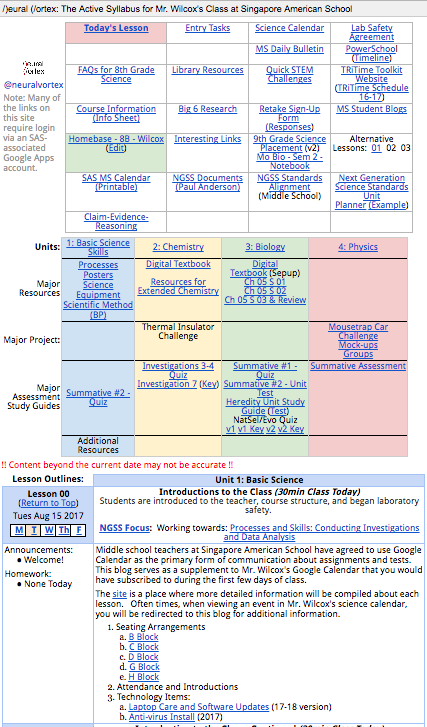 Active Syllabi are similar to the popular HyperDocs popularized by Lisa Highfill, Kelly Hilton, and Sarah Landis. However, Active Syllabi take the idea a step further by including an entire course worth of information into a single document that can be updated on the fly. Among the many other functions of a course syllabus, a detailed syllabus provides education stakeholders (teachers/students/parents/administrators) with a clear view of the logistics of a course, the resources being utilized and the conceptual framework of the course. INCREASED PRODUCTIVITY: Increasingly, educators utilize web-accessible resources with their students. For schools with one-to-one laptop programs, Google Apps for Education (GAFE) is a favorite working environment. Though an Active Syllabus could be developed using any web-publishable format, one developed as a Google Doc has the added advantage of being fully integrated with a school's/teacher's/district's chosen method of resource development. If you're an educator with an Active Syllabus, I'd like to see it and link to it on /)eural (/ortex as an exemplar.